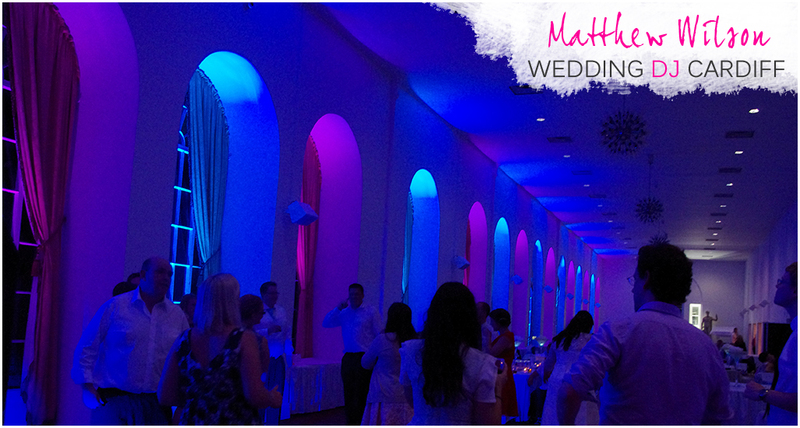 On Saturday 3rd August 2013, Emma and Patrick got married at the Orangery at Margam Park to become Mr and Mrs Sheedy. The Orangery is the longest in the British Isles, so you can imagine just how large it is! The wedding ceremony took place early in the afternoon in the one half of the Orangery, the wedding breakfast, speeches and the evening entertainment took place in the other half of the Orangery. The speeches were undertaken by the father of the bride, the groom and the best man. They didn’t end there though, there were also speeches given by the uncle of the bride and the bride herself. Following the speeches, I played some up tempo background music while I set up the uplighting under every one of the sixteen alcoves down the length of the building. 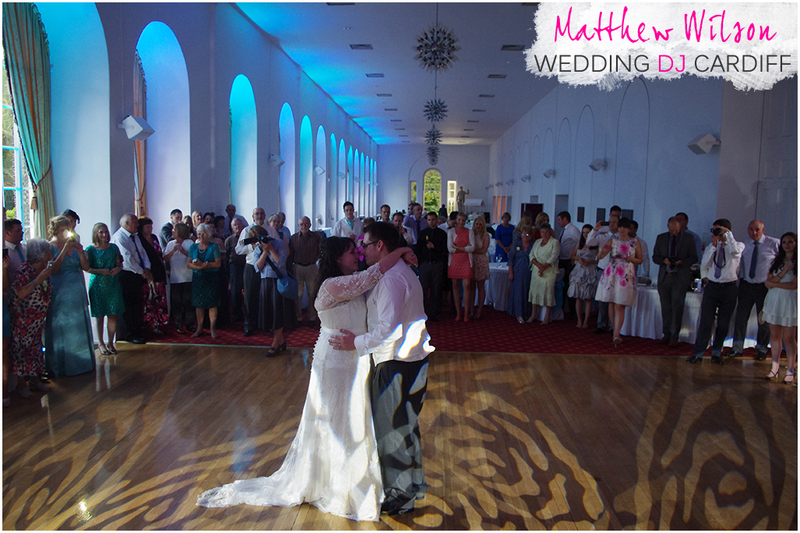 The first dance was to Rebecca Ferguson’s – Nothing’s real but love (acoustic). 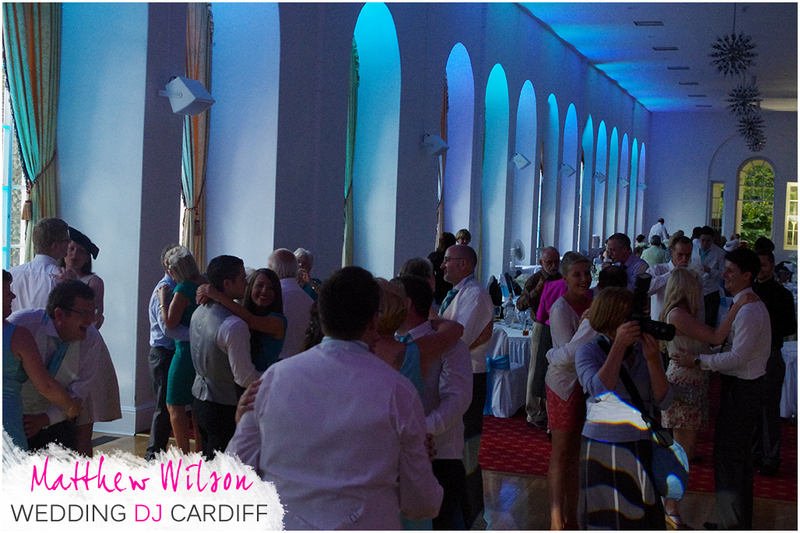 I gathered all of the guests to the dance floor for the first dance, as you can see the Margam Orangery itself is impressively long so it was important for the guests to be close to the bride and groom for this once in a lifetime moment. The first thing the photographer asked me was “You haven’t got any of those little coloured dot lights have you?”, which is actually a question EVERY photographer asks. 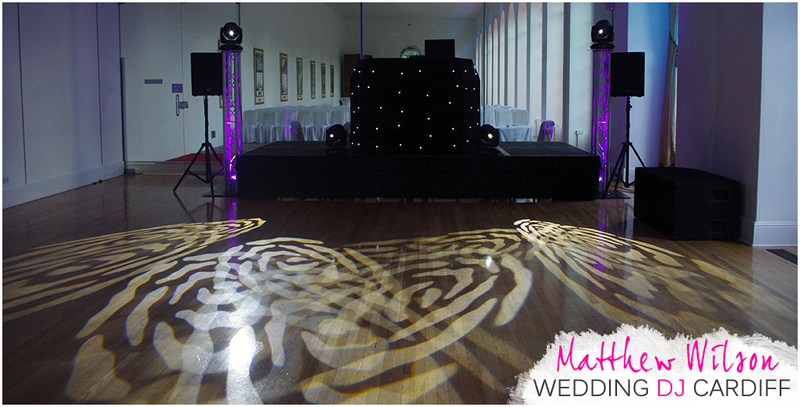 The little dots which come from cheap LED lights ruin photographs, which is why I only use expensive lights known as Chauvet Intimidator 350 Spot Moving Heads – Quite a mouthful, but they really give me the effect I want for the bride and groom’s first dance. – I can’t wait to see the photographs taken by the professional photographer! At no point throughout the entire evening was the dance floor empty. From the very first dance to the end of the night there were always guests up dancing. From a DJ’s perspective, you know you’ve got a great group of guests when they don’t wander off to the buffet once I’ve announced it. In fact it was quite a memorable announcement, I mentioned the buffet was open at the end of a song, so the guests started to make their way off the dance floor until I played the next track, which was followed by laughter and everyone staying to dance. 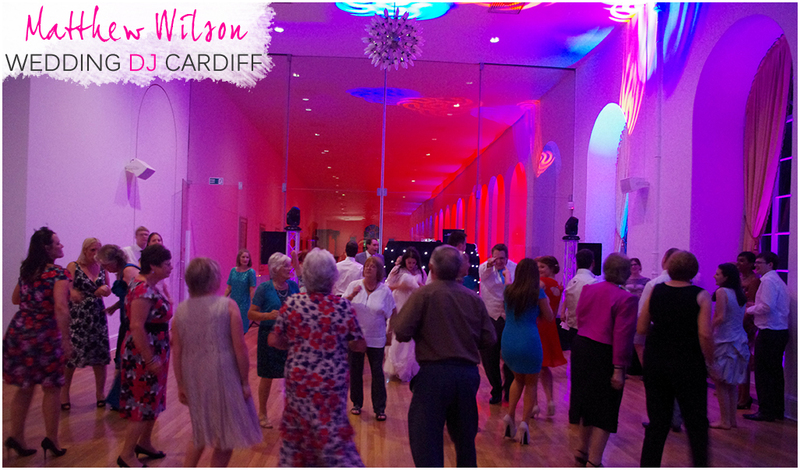 The uplighting spanned the entire length of the Margam Orangery, which really put my wireless lights to the test, as you can see they had no trouble picking up the signal and doing what they should to make the room come to life. As the evening went on, the guests continued to dance and I managed to make a quick trip down to the far end of the Margam Orangery to sample the evening buffet. For those of you reading this who were at the wedding, I really hope you tried the welsh cheese sandwiches and the mini hog roast rolls – they were AMAZING! The staff at the Margam Park Orangery were very friendly and helpful, which is always a bonus when working at a wedding venue. The positive attitude of the staff reflects on the service the guests receive, happy staff = happy guests! Just before the end of the evening the bride and groom made an old fashioned early exit before the guests, so with twenty minutes still remaining on the clock, Patrick and Emma danced their final dance of the evening to Semisonic – Closing Time. There was very little time left after the departure of the bride and groom and I finished off with a few requests. I’d like to say thank you very much to Patrick and Emma for booking me and I also want to thank the family and friends of both the bride and groom who all played their part in making this such a fantastic and memorable wedding day. Great day, great evening, great wedding!